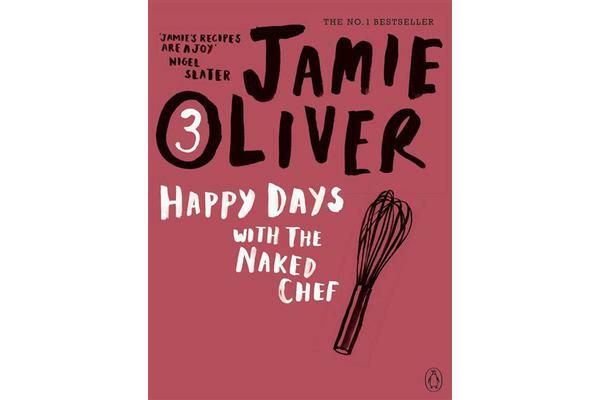 Jamie Oliver’s no 1 bestseller, Happy Days with the Naked ChefJamie is one of Britain’s best-loved chefs who has made cooking interesting and accessible, not only for a new generation but for all those who love good food. He believes in getting the most out of ingredients and making tasty, easy, sociable food with the minimum of fuss. Like his first two books, Happy Days is filled with fantastic recipes for different occasions. By keeping it simple, it is perfect for those who want to give it a go in the kitchen. Happy Days with Naked Chef contains loads of classic, easy recipes like the fluffy pancakes USA style, Jamie Oliver’s ultra-simple pukka pineapple with bashed-up mint sugar, and his old man’s superb chicken. Genius.‘There is only one Jamie Oliver. Great to watch. Great to cook’ Delia Smith ‘Great, fabulous. Just enjoy yourself, get stuck in, happy days’ SpectatorJamie Oliver’s career started as a chef at the River Cafe, where he was quickly spotted by the television company that made him famous as The Naked Chef. He has since published a huge range of bestselling cookery books, including The Naked Chef, The Return of the Naked Chef, Jamie’s Dinners, Jamie Does, Jamie’s Ministry of Food, Jamie’s Kitchen, Cook with Jamie, Jamie at Home, Jamie’s Italy, Jamie’s Great Britain, Jamie’s 30 Minute Meals and Jamie’s 15-Minute Meals.